Page 5 SPACEPORT NEWS April 19, 2002 Above, Bill Deaver, lead, checks an element in the ECS at pad A. Technician Dave Kline, at left, works at the console of the Environmental Control System (ECS) at Pad A. Jerry Lovelace, at left, checks a light in an escape tunnel under Pad B. Lovelace is lead for the pads Environmental Control System. The system is adjacent to the pads rubber room and escape tunnel. Those heritage features were designed for emergency use by Apollo astronauts and pad crew. At left, Rick Mako, Joe Rosenbaum and Paul Dinicola modify a bracket for the External Tank vent arm. Below, Alan Baleyko cleans off rust and oxidation from the structure of Pad B during preparation for the STS-110 Mission launch of Atlantis. A and Bsupport the move of the Rotating Service Structure at Pad A as Space f or launch. Above from left, engineers Kevin Ahrens of USA, Steve Stout of Dynacs and Allan Brush of USA discuss a new flow meter being tested at Pad B. Suzanne Pitts, right, helps clean Pad B in preparation for Endeavour being rolled out to the pad for the STS-110 launch. Before each rollout, the pad is carefully cleaned of debris. April 19, 2002 SPACEPORT NEWS Page 6LIGHTNING ...(Continued from Page 3)  Lightning often strikes the same place repeatedly, especially if its a tall, pointy, isolated object. The Empire State Building has been used as a lightning laboratory since it is hit nearly 25 times a year. Lightning often strikes more than three miles from the thunderstorm, far outside the rain or even thunderstorm cloud. Bolts from the blue, though infrequent, can strike 10 to 15 miles from the thunderstorm. Most cars are reasonably safe from lightning. But its the metal roof and metal sides that are protective, not the rubber tires. Convertibles, motorcycles, bicycles, open-shelled outdoor recreational vehicles, and cars with plastic or fiberglass shells offer no lightning protection. The human body doesnt store electricity. It is perfectly safe to touch lightning victims to give them first aid. Being underneath trees is the third leading activity for lightning casualties in Florida. And just being inside a house isnt failsafe. You must avoid any conducting path leading outside, such as corded telephones, electrical appliances, wires, TV cables, plumbing (including plastic pipes with water in them), metal doors or windowNo place outside is safe near a thunderstorm. The 45th Space Wing and KSC have outstanding lightning safety procedures. While on base, follow local procedures immediately, when 45th Weather Squadron issues a Phase-1 or Phase-2 lightning condition. A Phase-1 lightning condition means 45th Weather Squadron is forecasting lightning to occur within 5 nautical miles in 30 minutes for the 13 points of operational interest on KSC, Cape Canaveral Air Force Station, Patrick AFB, and elsewhere. Five nautical miles is about 6 normal statute miles. A Phase-2 lightning condition means lightning is imminent or occurring within 5 nautical miles of the point(s). Notice how a 5-nauticalmile safety buffer distance is used. When it comes to lightning safety, distance is your friend. Off-base, use the 30-30 Rule. Count the time between seeing the lightning and hearing its thunder. If it is 30 seconds or less, go to the safest location possible. Wait 30 minutes or more after hearing the last thunder before going back outside. The safest place from lightning available to most people is a large, fully enclosed, and substantially constructed building, such as a typical house or office building. Substantially constructed means it has wiring and plumbing. Once inside, stay off the corded telephone, away from electrical appliances, away from plumbing, and away from windows or doorways to the outside. The second safest place from lightning is a vehicle with a solid metal roof and solid metal sides. Put your windows up, put your hands in your lap, and lean away from the doors. Tuesday: Lightning science. Lightning is aframes. Dont stand near a window. Staying in an inside room is best. Sports is the activity with the fastest rising rate of lightning casualties. No game is worth death or lifelong severe injury. All people associated with sports should have a lightning safety plan. Height, pointy shape, and isolation are the dominant factors controlling where a lightning bolt will strike. The presence of metal makes virtually no difference on where lightning strikes. Mountains are made of stone, but receive many strikes each year. But while metal doesnt attract lightning, touching or being near long metal objects (fences, railings, bleachers, vehicles) is still unsafe when thunderstorms are nearby. If lightning does happen to hit it, the metal can conduct the electricity a long distance (even more than 100 yards) and still electrocute a person. As an absolute last resort, use the lightning crouch rather than lying down if you are trapped outside during a storm. Put your feet together, squat low, tuck your head, and cover your ears. This offers a bare minimum of protection, so plan to avoid lightning threats instead.Lightning factshuge electric spark neutralizing electric charge generated and separated in a thunderstorm. Seventy percent of lightning doesnt strike the ground. Lightning doesnt choose what it will strike until it is about 30 yards away. The average distance between lightning flashes is over 3 miles. Wednesday: Outdoor lightning safety. As noted before: No place outdoors is safe near a thunderstorm. When outside, always use the 30-30 Rule described earlier. Avoid the following locations and activities because your life depends upon it. Elevated locations or open areas. This includes sports fields, including golf courses. Water-related activities: swimming, boating, and fishing. Dont go under trees to keep dry during thunderstorms. Lightning that strikes trees can also strike people standing under them. Or trees can explode from lightning super heating the water and sap inside them. Trees are also dangerous since the lightning often dissipates outward along the surface of the ground. Trees are also a preferred area for upward streamers. Nearby tall isolated pointy objects, such as people, can cause upward streamers (30-yard tall vertical sparks) to form where they are standing. Get out of open-shelled outdoor construction and farm equipment, such as bulldozers and tractors. Thursday: Indoor lightning safety: The safest place from lightning is inside a large, fully enclosed, substantially constructed building. When inside, stay off corded telephone. The telephone is the No. 1 cause of indoor lightning casualties. Cordless phones are okay, as long as you are away from electrical appliances. Stay away from electrical appliances. Stay away from plumbing: Dont shower, bathe, or use the toilet when lighting is nearby. Dont watch lightning through windows and open doorways. Friday: Medicine and lightning. Only 10 percent of people struck by lightning are killed. All lightning deaths are from cardiac arrest and stopped breathing. The recommended first aid is CPR or mouth-to-mouth resuscitation. Ninety percent of those hit by lightning survive. But many survivors suffer life-long debilitating injury. Most injuries are neurological and are often difficult to diagnose. Typical long-term symptoms include memory deficit, sleep disturbance, chronic pain, dizziness, chronic fatigue and attention deficit. The intensity of these symptoms is often so severe that the lightning survivor cannot earn a living or maintain relationships  bright, productive, active lives ruined in an instant. Symptoms can be delayed up to months after the lightning strike. The Lightning Strike Electric And Shock Survivors International is the main support group. 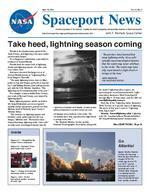 For daily weather forecasts and hazardous weather outlooks for the spaceport, visit the 45th Weather Squadron Web site at https:// www.patrick.af.mil/45og/45ws/index.htm For local weather forecasts outside of 45 SW and KSC, see www.srh.noaa.gov/mlb For lightning safety and other weather safety briefings, call 45 WS at 494-6807. SPACEPORT NEWS April 19, 2002 Page 7Like father, like son39th Space Congress to be held April 30-May 3Energy & Environmental AwarenessKennedy Space Center is Balancing Technology & Nature from April 22-24 during Environmental and Energy Awareness Week (EEAW). The 2002 Energy and Environmental Awareness Week will show the Center workforce the diversity of the Environmental Office and what the Center does to promote good stewardship of our fragile environment,  said John Ryan, chair of Environmental & Energy Awareness Week. On April 22  Earth Day  David Struhs, secretary of the Florida Department of Environmental Protection, will begin the week with an educational presentation at the opening and awards ceremony. At the event, which takes place at the Training Auditorium at 10 a.m., Struhs will discuss initiatives to keep Florida healthy, including the Governors energy budget priorities. EEAW will feature various demonstrations, presentations and field trips available for employees to learn about everything from storm water runoff pollution and indoor air quality to Floridas threatened scrub jay birds. Participants also will have the opportunity to see the latest environment-friendly automobile technology. The alternative fueled vehicles such as a CNG Honda Civic will be on display Tuesday and Wednesday. Activities April 23 will take place in front of the Headquarters Building, while the VABsVariety of activities planned for April 22-24parking lot E will be home to the April 24 events on Wednesday. Visit http://environmental.ksc. nasa.gov/eeaw/eeaw2002/index.htm for EEAW details including an events schedule, historical information on Earth Day, and much more. How to avoid littering Always dispose of your trash in a proper receptacle. Make sure trash cans have a secure lid and dont put out loose trash. Never throw anything from your vehicle windows. Cigarette butts take up to 12 years to decompose and are fire hazards. Always clean up your site after a picnic or other outdoor activity. Secure your load if you carry loose materials in a truck bed on the Spaceport. Fatalities have been recorded in Florida as a result of debris flying out of beds. Florida Statute prohibits littering and allows for fines up to $50. Members of the military and DOD civilians can be reprimanded for litter violations. Carry a litterbag in your vehicle and use it! The 39th Space Congress will be held April 30 through May 3 at the Radisson Resort in Cape Canaveral. The general theme of the Congress is Beginning a New Era: Initiatives in Space. The congress exhibit hall will open April 30 and be open to conference participants and the general public. Major events include the opening session on April 30, followed by three days of paper and panel sessions that will explore all of the issues facing the space industry in the early part of the new millennium. Activities for students and educators include a science fair in conjunction with the exhibit hall, a meet-the-astronauts opportunity on May 2 and a student education day on May 3. The congress will conclude with a golf tournament on May 3. Sponsored by the Canaveral Council of Technical Societies, Space Congress is organized in cooperation with NASA, the department of Defense, industry and academia. Since CCTSs first symposium in 1962, the Congress has provided for a gathering of the international aerospace community to discuss the status and future of space activities around the world. For further information or on-line registration, visit the Space Congress web site at http://www.SpaceCongress.org.Mike Wright, Goddard Space Flight Center integration and test manager for the FREESTAR Hitchhiker payload, is pictured with his 4year-old son, Alexander, in the Multi-Payload Processing Facility. Alex visited KSC to view the Space Experiments Module canister where his schools tomato seed experiment is housed. The St. John the Baptist Preschool (New Freedom, Pa.) experiment will fly with FREESTAR on STS-107, which is currently scheduled to launch July 19. KSC Future Payload Manager Virginia Whitehead said that, to her knowledge, Alexander is the youngest researcher ever to have visited KSC. Page 8 SPACEPORT NEWS April 19, 2002 John F. Kennedy Space Center Managing editor. . . . . . . . . . . . . . . . . . . Bruce Buckingham Editor. . . . . . . . . . . . . . . . . . . . . . . . . . Kathy Hagood Editorial support provided by InDyne Inc. Writers Group. NASA at KSC is located on the Internet at http://www.ksc.nasa.gov USGPO: 733-133/60006Spaceport News Spaceport News is an official publication of the Kennedy Space Center and is published on alternate Fridays by External Relations and Business Development in the interest of KSC civil service and contractor employees. Contributions are welcome and should be submitted two weeks before publication to the Media Services Branch, XAE-1. E-mail submissions can be sent to Katharine.Hagood-1@ksc.nasa.gov40 years ago: 1st international satelliteForming worldwide partnerships has been a way of life for space pioneers long before the development of the International Space Station. Forty years ago, the United States and the United Kingdom joined forces, and that collaboration resulted in the launch of the Ariel-1 satellite on the Delta-9 rocket April 26, 1962. Ariel-1, also known as UK-1, was the first launch of an international satellite. The satellite, which departed from Cape Canaveral Air Force Stations launch pad 17A, carried six instruments developed and provided by university scientists from the U.K. The Delta launch vehicle, a reliable means at reasonable cost  even cheap as Delta manager Bill Schindler used to say  was now available to place scientific instruments into space far above the earth, said Don Sheppard, an aerospace engineer from Goddard Space Flight Center (GSFC) who supported and coordinated preparation of the satellite and integration with the launch vehicle. Ariel-1 was constructed at GSFC as a platform, power system, and data relay for the instruments. The tools measured the intensity and energy spectrum of X-rays from Remembering Our Heritage more than 20 solar flares, attained the first look at cosmic rays, and calculated the cosmic rays effect on the electron density and ion distribution in the ionosphere. The satellite was used for several months until some of the instruments were weakened by radiation from a high altitude nuclear test. However, Ariel-1 returned data intermittently until late 1964. In astrophysics and astronomy today, the magnificent performance of the Hubble telescope, as well as the shuttle astronauts, and results from other specialized satellites have shown us things we never dreamed of back in the old days, said Sheppard, who participated in 200 satellite launches for space science, planetary exploration, communications, and weather studies until his retirement in 1982. A strong person could pick up Ariel-1 and carry it around, but it did its job and it was a beginning  a first. It was wonderful to have a job where just about everything you did related to something that had never been done before. This is still true in many respects today at Kennedy Space Center, and every worker should take pride in making history like we did in the old days. It keeps you dedicated.Ariel 1 launch paved the way for other cooperative effortsThe Florida Solar Energy Center (FSEC), a research institute of the University of Central Florida, has been awarded a hydrogen research grant of $5.425 million from NASA Glenn Research Center. This hydrogen research program was developed to support NASAs Space Launch Initiative (SLI) and Kennedy Space Centers Spaceport of the Future plans. The grant is an 18-month effort co-managed by NASAs Glenn Research Center and Kennedy Space Center. Research will be conducted by the Solar Energy Center and other state universities. This research program teams Floridas university researchers with NASA Glenn, the nations premier space research facility and NASA KSC, the nations premier space launch facility  a powerful partnership. FESC has long been recognized for its excellence in hydrogen research.FSEC wins SLI grantThe first international satellite, Ariel-1, launched on a Delta-9 rocket April 26, 1962, from Cape Canaveral Air Force Station.